While we have already discussed how we design our custom Warning Label Solutions, why choose custom labels as opposed to generic “Warning!” and “Attention!” labels? While the generic option might seem like a decent choice, the benefits of custom warning labels outweigh the alternative. Accurate protection: Rather than just having standard text or safety instructions, the custom solution offers the ability to be as specific as necessary. From a custom image to instructional text, designing a warning label that is relevant to the machinery, equipments, etc. adds to the protection of those involved. Custom size and shape: Finding a label that fits into a spot exactly can be challenging and nearly impossible. Rather than applying a standard shaped label across from a button or lever, custom shaped labels offer the ability to apply a label around different parts. Therefore, the important message is less likely to be missed. Enhanced durability: Depending on the environment in which the label is going to be applied, certain materials, adhesives, and laminations might be required to ensure that the label stays intact. A custom label recipe ensures that your label has been designed specifically to achieve your custom requirements. Safety instructions and information are most effective when they are designed specifically for the required part, machine, etc. 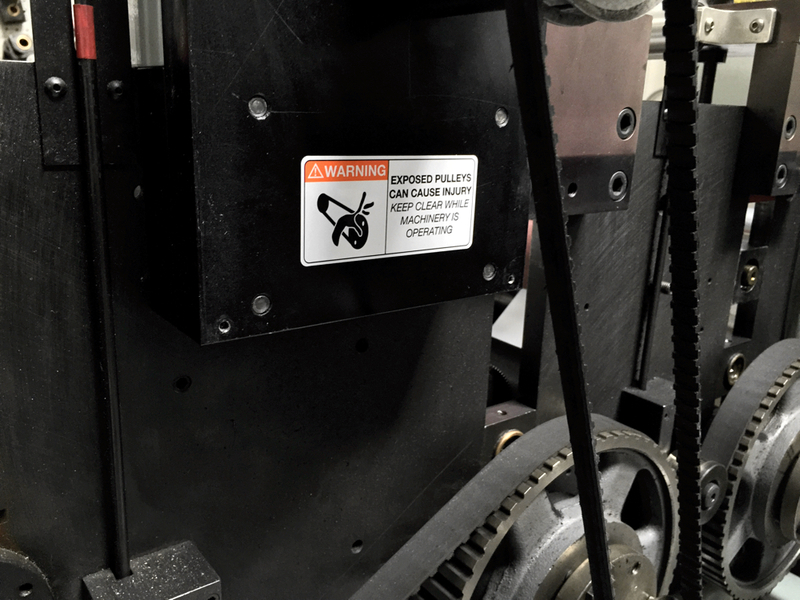 The bottom line: While generic warning labels can be an appropriate option for some circumstances, custom warning labels provide precision, reliability, and durability that the generic option cannot. Thus offering the peace of mind in knowing that those involved are aware of possible dangers.